"This book contains a rich collection of wisdom, experience, and insight for addressing the gaps in learning and development that the traditional models for training, talent development, and succession planning fail to address. As you address your own executive development needs or those of others, we hope you′ll create your own recipe for pulling everything together. A rich stock of openness, vulnerability, and learning readiness forms the base for developing leadership capacity and can carry all of the ingredients that high–performing managers need to set the table for extraordinary leadership." The Center for Creative Leadership (CCL) is the world′s largest institution devoted exclusively to leadership research and education. Since 1970, CCL has studied and trained hundreds of thousands of executives and worked with them to create practical models, tools, and publications for the development of effective leaders and leadership. Introduction (Kerry A. Bunker, Douglas T. (Tim) Hall, Kathy E. Kram). PART ONE: THE GAP WITHIN. 1 Views from the C–Suite (Naomi S. Marrow). 2 The Learning Premise: A Conversation with Peter B. Vaill (Peter B. Vaill, with Kerry A. Bunker and Laura Curnutt Santana). 3 Unlocking Leadership Potential: Overcoming Immunities to Change (Deborah Helsing , Lisa Lahey). PART TWO: THE GAP BETWEEN. 4 Helping Leaders to Become Emotionally Intelligent (Cary Cherniss). 5 Leadership as Relational Practice (Joyce K. Fletcher). 6 The How–to–Be Leader: A Conversation with Frances Hesselbein (Frances Hesselbein, with Kathy E. Kram). PART THREE: THE GAP IN THE SYSTEM. 7 The Not–So–Secret Sauce of the Leadership Development Recipe (Morgan W. McCall Jr., George P. Hollenbeck). 8 People in Context (Barry Oshry). 9 Leading Inclusively: Mind–Sets, Skills, and Actions for a Diverse, Complex World (Ilene C. Wasserman, Stacy Blake–Beard). PART FOUR: THE GAP AT THE INSTITUTIONAL LEVEL. 10 Developing Leaders with Cultural Intelligence: Exploring the Cultural Dimension of Leadership (Laura Curnutt Santana, Mireia las Heras, Jina Mao). 11 The Shifting Paradigm of Executive Leadership Development: Moving the Focus to the Impact of the Collective (Trina L. Soske, Jay A. Conger). 12 On the Other Side of the Divide: How Leaders Must Lead in the Post–Boom Era (Peter C. Cairo, David L. Dotlich). 13 Leadership in the Corner Office: The Board′s Greatest Responsibility and Challenge (Peter C. Browning). 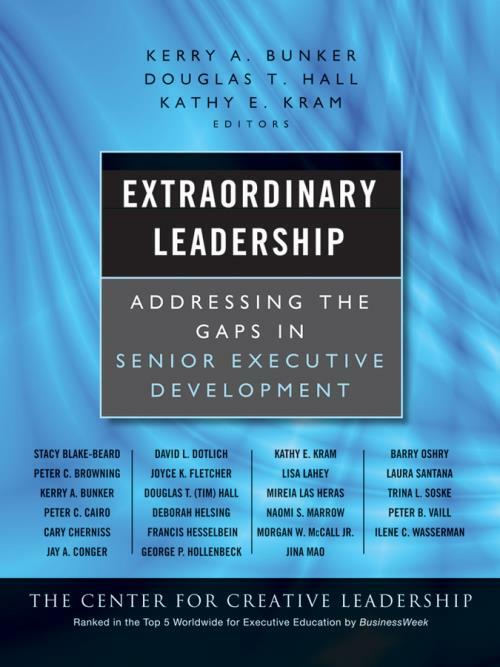 14 Looking Forward: Creating Conditions for Extraordinary Leadership (Kathy E. Kram, Douglas T. (Tim) Hall, Kerry A. Bunker). About the Center for Creative Leadership.